You'll be £19.99 closer to your next £10.00 credit when you purchase When Shall their Glory Fade?. What's this? Written by a Commando veteran of the Second World War, this is a remarkable, vivid and honest account of the battles and actions behind the thirty eight Battle Honours that were awarded to the Army Commandos by Her Majesty the Queen in 1958. Only operations deemed to be ‘thoroughly outstanding feats of arms’ were mentioned in the battle honours list. It therefore represents only a fraction of the raids and battles fought by the Commandos in their five years of active service. These Battle Honours are emblazoned on the Commando Flag that hangs in Westminster Abbey in London, almost opposite the tomb of the Unknown Warrior.The story of each honour is presented in the most direct way, using the first-hand experiences of the commandos, officers and men who actually took part in the fighting. What cannot be doubted is Dunning's admiration fro the men of the commandos, their bravery and effectiveness. The Anecdotes have skilfully been woven into the narrative. eye-opener of a book detailing what courage actually means. This is a story about the British military force that inspired special forces around the world, written by a Commando. British Commandos served in every theatre of WWII. Between the Dunkirk evacuation and the large scale raid on Dieppe, the Commandos were the only direct action force attacking the Germans in Occupied Europe as a uniformed organization of the British Army. The author has told their story with authority and feeling. This is a must read history from WWII. The book focuses in the raids and battles that ked to battle honours. Its author served with No. 4 Commando, and was thus a participant ins ome fo the raids he describes, before becoming a commando instructor. This might lead one to expect that the book was written some time ago, but that isn’t the case- this is a very recent piece of work, first published in 2011. The author thus has two advantages – in the nearly seventy years that have passed many of his fellow commandos had published in 2011. The author has published accounts of their actuins, and most official documents have been declassified. There are thus plenty of eyewitness accounts and extracts from official documents, and in particular war diaries. Written by Commando veteran of World War 11, this is a remarkable, vivid and honest account of the battles and actions behind the award of the thirty eight battle Honours that were awarded to the Army Commandos by Her Majesty the Queen in 1958. In his book WHEN SHALL THEIR GLORY FADE James Dunning has successfully combined a meticulously researched history development of Commando forces during World War II with absorbing eminently readable and human accounts of the courage, daring and military expertise that led to the award of so many battle honours. The Army Commando was formed at the request of Winston Churchill. offensive actions against the enemys extended coastline. Their existence as a military formation was short, only 5 years, but in this short time they proved themselves to be a brave,determined and aggressive foe. Well disciplined and superbly trained. and feared by their enemys. WW2 Connection recommend this book as their book of the month. of 3 Commando but experienced the events he writes about at first hand. A very good read full of extraordinary exploits of the Army Commandos. president of the Commando Association in 1992-1993. He is know aged 91 and lives in Romsey Hampshire. When the founded in 1940, Churchill said the Commandos' goal was to "butcher and bolt", so its appropriate that one of their founding members, James Dunning, should have come from the meat trade. His family had a string of butcher's shops in Southampton, but James's career has been carved out with the sword and then the pen rather than the cleaver. At the age of 91, he has just produced his latest book, When Shall Their Glory Fade?, which tells of the 38 battle honours awarded to the Commandos in World War 11 and which feature proudly on the military flag to hang in Westminster Abbey. The new books completes a commando trilogy, which James began with They Had to be Tough, and continued with The Fighting Fourth: No. 4 Commando at War 1940-45. He said the book, which has a foreword by Countess Mountbatten, had taken two years to research and would probably be his last. In his introduction, the author says "My main aim was not to provide an official record, nor a detailed history, but rather to tell the story with as many personal accounts as possible from the men who were actually there." 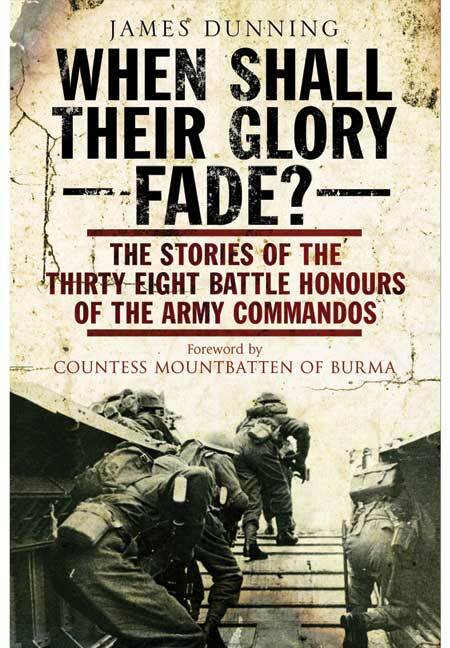 Written by a Commando veteran of World War II, this is a remarkable, vivid and honest account of the battles and actions behind the award of the thirty eight Battle Honours that were awarded to the Army Commandos by Her Majesty the Queen in 1958. These Battle Honours are emblazoned on the Commando Flag that hangs in Westminster Abbey in London, almost opposite the tomb of the Unknown Warrior. The story of each honour is presented in the most direct way, using the stories and experiences of the commandos, officers and men who actually took part in the fighting. It should be emphasised that the operations mentioned as Battle Honours recognised only those deemed to be thoroughly outstanding feats of arms and represent only a fraction of the raids and battles fought by the Commandos in their five years of active service. The formation of the Commandos was due to Winston Churchill, who proposed their formation in a directive dated 18 June 1940, which advocated limited offensive action against the enemy's extended and vulnerable coastline. This compilation includes photographs of training and combat in Norway, Dieppe, Normandy, Flushing and many more locations. There have been many histories of the commandos in the past, but this one is special, in a way, because it's been written by a commando, and refers to the memories and reminiscences of the men themselves, those whose glorious history is encompassed on the Commando flag in the Abbey. These first-hand accounts of the thirty-eoght commando operations are poignant and inspiring, The author joined the regular Army in 1939 and in 1940 joined No 4 Commando as a founder memner with the rank of sergeant. 1st May is the 40th anniversary of the laying up of the flag in Westminster Abbey in the presence of HM Queen Elizabeth the Queen Mother, and the book is a timely reminder of the contribution this remarkable company has made in defending the freedom of this country.